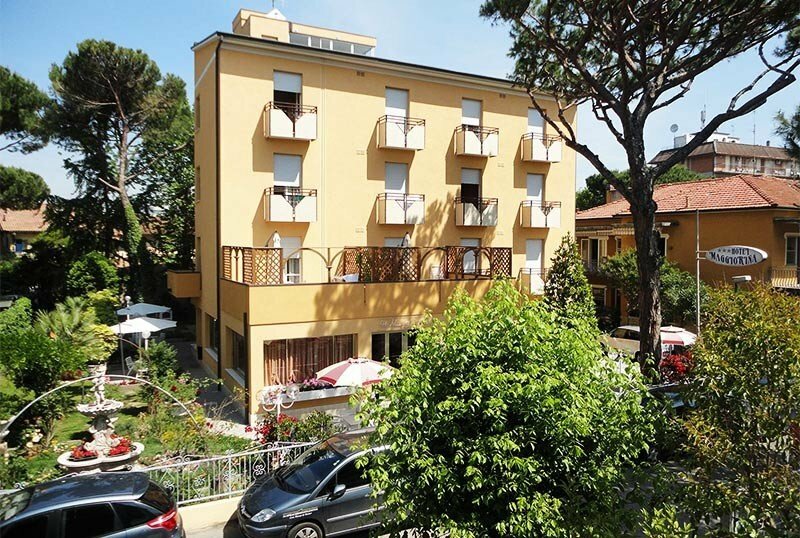 Centrally located near the sea and in the center of Cervia, Hotel Maggiorina offers a garden, enclosed parking, WI-FI internet access, air conditioning, games and menus for children. Small pets are allowed. The hotel is located in Cervia, in a privileged, quiet and sheltered position, behind the long canal and near the beach. The city center can easily be reached on foot in 5 minutes. All rooms have a balcony, chandeliers with fans, safe, satellite TV, WI-FI connection and a private bathroom with shower, hairdryer and complimentary toiletries. For an extra charge: air conditioning. FAMILY: on request we can have multi-bed rooms. Equipped garden, bicycles available, sun terrace, lift, reading room, luggage storage, beach towels for free use. Late check out service is available, subject to availability. The hotel organizes theme nights. PARKING: private fenced, available for all customers. AIR CONDITIONING: free in public areas, for a fee in the rooms. BREAKFAST: sweet and savory buffet, with homemade cakes and desserts, pies and biscuits. LUNCH AND DINNER: offers a home-made cooking, every day a choice menu with dishes from Romagna and other Mediterranean fish and meat specialties, followed by a buffet of seasonal vegetables. VARIATIONS: on request the kitchen is available to prepare specific menus for coeliacs. In hotel: indoor and outdoor playground area. At meals: high chairs at the table, special and personalized menus served flexible lunch hours. The beach agreement with the hotel, Bagno Sorriso 227-228, has a baby park, private hot showers, a playground, a beach volleyball court, two tennis courts, a bocce court, a refreshment bar area and WI-FI connection. Prices are per day and per person, full board for a minimum of 3 days. For shorter stays, an increase of 10% is applied to the list price. - Reservations are considered confirmed after sending a deposit of 20% of the entire amount per room. - Beach service: any requests for additional services (additional bed, special positioning, additional days) must be agreed directly between the client and the lifeguard.